This charming and tastefully remodeled bungalow is on the Los Angeles Historical Register and protected under the Mills Act Tax Benefit. 3 Beds | 2 Baths | Built 1917 | 1,815 Sq. Ft. Located in the Spaulding Square Historic Preservation Overlay Zone – a neighborhood of modest one-story Period Revival styles houses built between 1916 and 1926 – this charming and tastefully remodeled bungalow is on the Los Angeles Historical Register and protected under the Mills Act Tax Benefit. 1329 North Genessee Avenue is one of the 600 or so properties that have benefited since the City of Los Angeles adopted local Mills Act legislation in 1996. The Mills Act Historical Property Contract Program allows qualifying owners to receive a potential property tax reduction and use the savings to help rehabilitate, restore and maintain their buildings. The Mills Act is the single most important economic incentive program in California for the restoration and preservation of historic buildings by private property owners. Enacted in 1972, the Mills Act legislation grants participating local governments (cities and counties) authority to enter into contracts with owners of qualified historic properties who actively participate in the restoration and maintenance of their properties to receive property tax relief. Set on a gentle rise above the curb and facing East, the California Bungalow is drenched in natural sunlight throughout the day. Built in 1917, The house features 3 bedrooms and 2 baths with 1,815 sq. ft. of living space. Note the impeccable clapboard siding, front porch, and dormer windows, some of the many aesthetic details foretelling the home’s pedigree. Dormers resting on roof top add an interesting element to an otherwise plain roofline and distinguishes it from surrounding homes. Mature hedges enclose the grassy front yard. Two royal palms, establishing the Southern California setting, mark the property from the street, and enhance the uniformity of the architecture. The Arts and Crafts movement incorporated locally handcrafted wood, glass, and metal, creating objects that were both simple and elegant. Arts and Crafts architecture encouraged the visibility of handicraft, local natural materials, and originality. Craftsman bungalows were designed with a goal of “ennobling modest homes for a rapidly expanding American middle class.” Here, beneath the prominent covered entry, craftsman floor to ceiling windows flood in light from the East. That’s the original solid wood front door promising more inside. Valuing nature and harmony over technology and automation. Treasuring traditional crafts. Craftsman style was a reaction to the overly ornate Victorian era. Grounded in socialist political theory, the Movement espoused the value of the craftsman over the machine. True bungalows have a simple living rooms. The restoration at 1329 North Genessee included refinishing the hardwood floors and the crown moldings. 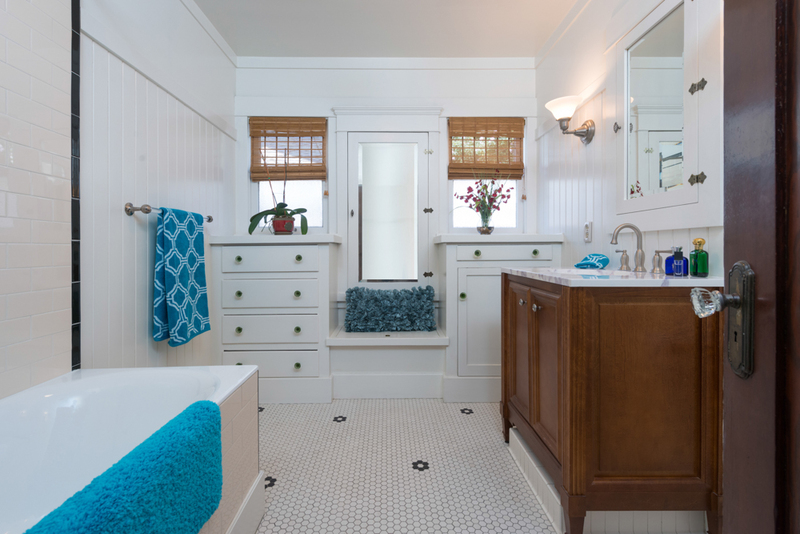 Bungalow ceilings – though typically lower than in Victorian architecture, often are higher than in ranch style and other homes built later in the century. A wood burning fireplace is the focal point of the bungalow living room. More than just a decorating style, The Arts and Crafts Movement cast back into history for a more enlightened way of living, and to honor artisanal traditions that dated back centuries. The movement treasured the traditional crafts of the past that, without attention, were doomed to be forgotten. Here you’ll find a true craftsman style home living room – cozy, an inviting common area designed to be entered directly from the front door. A broad opening from the living room into the separate dining room is another common craftsman home feature that pleased the sensibilities of craftsman movement. Classically detailed: Built-in cabinetry gave home designers the opportunity to incorporate wood and glass craftsmanship into the public aspects of the home. Here, in the dining room the original work is impeccably preserved. Interior wood details are a signature look most people associate with the arts and crafts home. The scenic murals transport one to a simpler era. Reacting to both Victorian architectural opulence and increasingly common mass-produced housing, you’ll find in craftsman design a visible sturdy structure, of clean lines and natural materials. One notes that the three bedrooms are all unique in function and layout, all individually inspiring. Another Arts and Crafts design development arising from the class-shift of the time was the built-in “breakfast nook” in the kitchen. It was designed as the heart of the family’s daily life. Unlike Victorian homes that had no place for informal eating, the breakfast nook provided a place for the family to gather at any time of the day or evening, particularly while food was being prepared. The idea was that the middle-class housewife of the era would not have domestic servants (at least not live-in ones). She would be doing much of the housework herself, as well as watching the children. These added roles made it important that the kitchen be integrated into the main house with easy sight lines to the common areas of the main floor (the dining and living rooms) with easy access the back yard. Beautifully appointed kitchen with Craftsman friendly details. Arts and Crafts ideals dovetail with today’s functional sensibilities. Simple and elegant: The Arts and Crafts movement encouraged artistic work in all branches of handicraft. California Bungalows are very convenient for the homeowner in that all living areas are on a single-story and there are no stairs between living areas. These homes are notably well-suited to persons with impaired mobility, such as the elderly or those in wheelchairs. The movement naturally emphasized handiwork over mass production, and wholeheartedly against the eclectic, over-decorated Victorian aesthetic. The Arts and Crafts style’s American arrival coincided with the decline of the Victorian Era. Ideally, bungalows are integrated with the earth by use of local materials and transitional plantings. 1329 North Genessee opens the homeowner to creative possibilties. Many of the lots in Spaulding Square were purchased by individuals who built and designed their own houses, with very few of the houses designed by professional architects. Other lots were purchased by contractors who either built houses to their own plans. Now a century old, the surrounding neighborhood is distinctive for its modest side-by-side period revival homes lining idyllic avenues. 1329 North Genessee Avenue was built in 1917 by contractor August Hanson, who was responsible for the construction of 21 houses in Spaulding Square. Hanson’s bungalows featured open, free flowing public rooms and rich detailing. Towering royal palms now mark the property’s walkway. A bright oasis on a street that is swathed in shade cast by mature fig and magnolia trees. Spaulding Square’s location off Sunset Boulevard, between the studios in Hollywood and the star’s homes in Beverly Hills, made it an especially appealing place to live for film technicians and up and coming actors. Hollywood royalty, Lucille Ball, was among the many who once called Spaulding Square, home. Film and Television Actor, Kevin Kilner, known for Home Alone 3 (1997); A Cinderella Story (2004); and American Pie 2 (2001), owned the California bungalow style house. Norman Steinberg also lived in the house. Steinberg is a writer and producer, his impressive credits truly too numerous to list include: Blazing Saddles (1974), Cosby (1996) and My Favorite Year (1982). Linda Hunt also lived in 1329 North Genessee briefly with her spouse, Karen Klein. Hunt made her big screen debut in 1980’s Popeye and is perhaps best known for her role as the Eurasian dwarf Billy Kwan in the 1982 film The Year of Living Dangerously. She won the Best Supporting Actress Academy Award for her performance, the first Oscar that went to an actor playing a character of the opposite gender. Hunt is currently a cast member of the CBS series NCIS:Los Angeles. Source: Linda Hunt. 2015. The Biography.com website. Available from: http://www.biography.com/people/linda-hunt-212165 [Accessed 09 Jan 2015]. Designated a Historic Overlay Preservation Zone in 1993, Spaulding Square is one of Hollywood’s most beautiful residential communities. Here you’ll find approximately 160 single-family homes built between 1916 and 1926 and ranging in style from Colonial Revival bungalows, to Italian Renaissance and Spanish Colonial to English, Prairie, and Mediterranean. The neighborhood features some of the most iconic Los Angeles Craftsman homes, 1329 North Genessee among them. Spaulding Square was named after real estate speculator Albert Starr Spaulding who purchased and subdivided the land in 1914. Spaulding attracted buyers to the area using a “lecture and lunch” strategy whereby interested buyers received a free streetcar ride, a meal, and a talk on the endless possibilities of the area. In fact, one of the impetuses for the development of Spaulding Square was the rise of the nearby film Industry. From 1919-1925 numerous studios were built in the Hollywood Area. United Artists Studios Charlie Chaplin, Mary Pickford, Douglas Fairbanks and D.W. Griffith Located United Artist Studios at Santa Monica Blvd. and Formosa Avenue. Charlie Chaplin also built an independent facility nearby on La Brea Avenue. Chaplin began construction on his independent movie studio in 1917 after purchasing a five-acre parcel of land at the corner of Sunset and La Brea Boulevards from a man named R.S. McClellan, who lived on the property at the time. Charlie Chaplin Studios featured production offices; a screening room; a film laboratory; a large ten-room house where his brother sometimes lived; a backlot; a swimming pool; tennis courts; stables; and two soundstages. Tudor-style cottages were built along the perimeter of the lot giving the property an English village appearance. Chaplin filmed numerous hit movies including Gold Rush, City Lights, Limelight, Modern Times, and The Great Dictator. The Jim Henson Company made the studio its new home in 2000. That’s Kermit in a Chaplin-esque pose greeting at the main entrance. Charlie Chaplin’s likeness can be seen in the arched doorway below. The growth of still more studios located further east along Sunset Blvd and Melrose Avenue created an unprecedented demand for housing. Sunset Blvd. became the major route between the studios in Hollywood and the star’s homes in Beverly Hills. Spaulding Square thrived. It was specially appealing to film technicians and up and coming actors for its proximity to the studios, as well as being conveniently located off the Pacific Electric Hollywood Line. 7500 Sunset’s triangular footprint is a vestige of a long forgotten streetcar route, formerly served by the Hollywood Line of the once expansive Pacific Electric Railway. More than sixty years after the fabled “Red Cars,” ceased operations through the neighborhood, their former right-of-way is still visible in satellite imagery, cutting a diagonal swath between Hollywood and Santa Monica Boulevards. 7500 Sunset is a new residential complex planned adjacent to Spaulding Square. Intended to replace a cluster of one-story commercial buildings at 7500-7580 Sunset Boulevard. The mixed-use development from West Hollywood-based Faring Capital would invigorate two sleepy blocks between Gardener and Curson Avenues with 236 luxury residential units above 30,000 square feet of neighborhood-serving retail and restaurant space. Designed by Santa Monica’s Killefer Flammang Architects, the project calls for two low-rise structures featuring high-quality finishes and ample outdoor amenities. At the behest of nearby residents, the developer recently agreed to a significant increase in the project’s subterranean parking accommodations. Additionally, Faring Capital proposes a variety of community benefits, including streetscape improvements, 24 hour on-site security, and contributions to the nearby Gardener Street Elementary School. Love this Blog. Love the rich history. Love the pictures.